Oh my goodness! It's Wednesday already! I lost this week. I haven't been home much and have done no crafting until yesterday afternoon when my picture was taken. I'm hoping to finish a couple projects today that are on my desk when I took my picture. And this picture is part of a group of wonderful crafters who are brave enough to show you their desks every Wednesday through the link up to Julia's Stamping Ground blog! She's been hosting this for 505 weeks. That's right! I have posted these in my Monday and Tuesday posts but here's all 4 together. Ok, I need to get back to work. Gotta get these projects done so I can move on to other projects. I have 2 dozen cards that need a good box bottom made so I can donate them to a silent auction for a special group of kids at church. Oh, I want to show you a great birthday gift from my hubby, my dad and his wife, and good friends, Larry and Angie! I've wanted a decorative windmill for a while that basically marks where our septic tank is so people won't drive over the pipe to it (it's buried but still vulnerable to very heavy vehicles). This stands 10 feet tall! With our recent weather it's been spinning like crazy! I can just imagine telling our propane delivery service to not go past the windmill when pulling in to fill our tank. I'm sure he'll be quite puzzled. Please head over to the Stamping Ground and check out the links to other desks! Hi Carol. Those boxes are a great idea - well done. And what a lovely gift - I would never have thought of asking for a ten foot tall windmill - good for you! Well the windmill is a great solution and it looks great too, bet you’re really pleased with it, what a great idea. Busy as ever. Aron, I love the valentines makes. Can always count on you to be ahead, I so wish I could come to one of your classes! Hi Carol, I love my TH mat, so easy to clean. I have quite a few dew drop inks, I really like them. 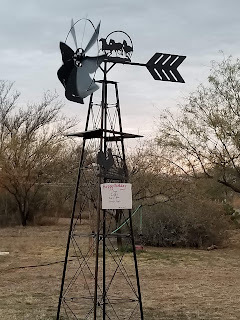 I love your windmill and what a great idea . I think a Windmill is a first on WOYWW! What a great prezzie, Ive always wanted a weather vane for the roof, perhaps I shall suggest it to my hubby! I love the little Valentines boxes, so cute!